Lose yourself in chocolate heaven with afternoon tea at Cocoa Cabana, award winning Chocolatiers, in West Didsbury, Manchester. Cocoa Cabana received a number of prestigious accolades within their first year of opening, such as the Guild of Fine Foods Taste of Gold Award 2013 and 2014. Their handmade chocolates are freshly made using the very best locally sourced produce. 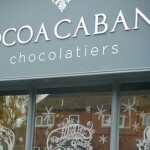 Cocoa Cabana is the brain child of Sarah Gallacher, who trained at the renowned Slattery’s Pattisier and Chocolatier. Chocoholic fans will drool at the selection of handmade truffles, chocolate shards and slabs rich with berries, nuts and fudge. 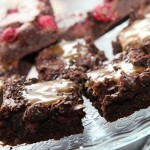 Their gooey brownies melt in the mouth and deliciously tempting chocolate cakes are handmade to order, but can be bought by the slice at weekends. The warm and welcoming Cocoa Cabana tea room provides a friendly spot to chat and catch-up with friends. Cheerfully decorated with traditionally stripped wooden floors, patterned wallpaper and bright, floral china you can easily while away a pleasant afternoon. Afternoon tea can also be enjoyed with Hasbean coffee or why not truly indulge with one of their sweet hot chocolates including their luxurious salted caramel hot chocolate. 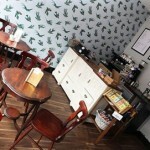 This small but perfectly formed chocolatier is a very popular venue. 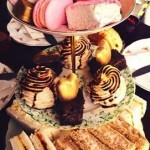 We have a delicious deal with Groupon for a chocolate themed afternoon tea for two at £29. Select the Book Now button for further information or to book online. Conviently situated a 5-minute drive from Burnage Rail Station, a visit to Cocoa Cabana is a real gem for those visiting Manchester. We have a gorgeous selection of afternoon tea venues in Manchester, why not take a moment and browse our other afternoon tea venues . . .